You can find here all the news and the ways to take advantage of Technical Support offered to customers who have signed a Maintenance agreement (CMS). If you are in possess of a regular License, you have the right to utilize the software as explained in “License of usage general Conditions”. If you have paid for the annual Maintenance agreement support, you will be able to use the latest update of the software acquired and the related Technical Support. The Maintenance agreement is valid from January 1 and expires on December 31 of the current year. The price agreed for the annual software support is calculated taking into account any additional modules and/or options enabled. The software can be used at any time, the expiry of the contract does not preclude the use, but does prevent it from updating and the right to receive technical support. The dongle includes coded information enabling the software license acquired, in the specific version chosen, with the related specific options. It includes the (year) usable version as well. It is necessary that your dongle is updated and enabled for the current year. 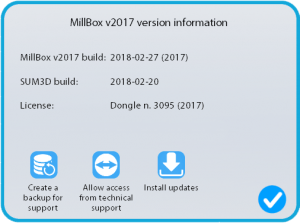 MillBox v2017 build: identifies the current installed version of the software. In the directory of the CAM (usually C:\MillBox) look for the “dkey.exe” file and run it (double click). A text file named dkey.log will be created and opened. This file will contain all information related to the hardware key, the coded license, and much more. 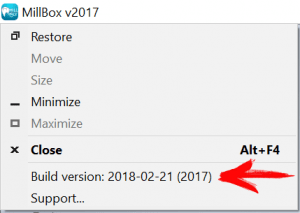 If the DONGLE version/year is older than the installed software, you are not enabled to use it. In this case, please contact your reseller to ask for the DONGLE update. 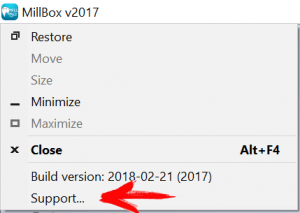 On the same dialog you can download and install the latest updated version, clicking on “Install Update”. rev. : identifies the current installed version of the software. In the directory of the CAM (usually C:SUM) search for the file “dkey.exe” and run it (double click). Technical support is granted to customers with a valid software maintenance agreement. Technical support is only guaranteed for current and/or prior to no more than one year software versions. Technical support has not to be intended as an on-line training course, this meaning that support is only for customers that have taken part to training courses no more than twelve months before. Customers with a Maintenance agreement have the right to ask for support to solve problems related to the acquired software malfunctioning. Technical support is provided by the company which you have signed your software sales or maintenance agreement with. in MillBox click on the MillBox icon on top/left and then on «Support». Then click on the icon «Create a backup for support»: two files are automatically generated and need to be sent to the email address found on the next page along with an explanation of the anomaly. in SUM3D Dental press the buttons Alt+Enter, write 987, then press Enter, click on ‘YES’. Now please wait for the software to complete its job of collecting information on the project that is currently open, the dongle number, the software version, the installed machines and configurations, and all other info that can be helpful to technical support to reproduce the same situation. This file will be automatically saved in C:\Users\username\Documents\CIMSYSTEM_SUPPORT. write an e-mail to support@cimsystem.com, with your company name, your contact reference name, telephone number, detailed description of your problem. This will give our Technical Specialists the chance to reproduce, understand and examine deeper and faster your problem, avoiding long-lasting network or telephone connections. Customers with a current year maintenance agreement (those signed with resellers as well) have the right to take part to the specific training meetings for free. Thanks to our established relationships with key players from the dental market worldwide, you can take advantage of free technical consultancy regarding CAD, scanner, tools, materials, machines, and anything else related to dentistry and dental technology in its entirety. This feature (also accessible from the interface SUM3D menu -> ? – Technical Support – Remote Access Support) permits the remote control of your computer by using the Internet connections (ADSL 640kb/sec or faster). Using this tool, we can directly show you on the monitor how to solve your problems.